Kathleen Ossip's poems occur in the charged space between journal entry, social history, philosophical treatise and dream: Do we want to understand poems, or do we want poems that understand us? Kathleen Ossip, The Cold War, Sarabande Books, 2012. 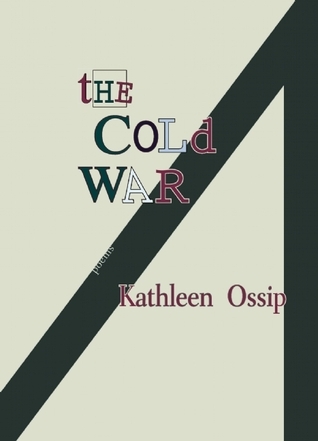 "The Cold War, Kathleen Ossip's second collection of poetry, is a work of startling breadth and wit. From the powerful drama and formal boldness of "The Status Seekers" to the post 9/11 trauma of "Document:" to the various theories of criticism in "The Nervousness of Yvor Winters," Ossip takes up the crazed threads of modern experience and all its contradictions. Each poem, each new approach is an attempt to extract something concrete from an era not yet past—a truly unique thought, a new theme, a personal memory. Yet as the poet probes and wonders, she gradually reveals another narrative, built on strangled emotion and subdued lyricism. "We're sliding aren't we" she remarks. The Cold War is jagged and thought-provoking. It questions the origins and premises of contemporary American culture." since the media has been the most horrifying experience of my life. I chemical, nuclear, biologically warfared on our turf. and aerial, commercial and ad, channel and station. Many people are badly distressed, and scared, by the anxieties, inferiority feelings, and straining generated by this unending process of rating and status striving. The status seekers, as I use the term, are people who are continually straining to surround themselves with visible evidence of the superior rank they are claiming. Sometimes it was hard to figure out how to be sincere. and all the time Givenchy was going on, and we didn’t know it. In place of the meadow grew a circle filled with squares. our hearts peeling, we could either plan it out , or we could do it. I wanted to be a holy girl, to sigh as if swimming in God. or straining to hit the birdie over the net and blast Jamie’s head right off. despair/passivity/collar-dirt clouded them like flies. (who worried: why had a saga never bloomed for them?). several diverged. How nausceous, how $14.99. Sweet peas, join me. Girls, pixie cuts, shifted, birdlike. It began with the rock, the river and the tree. We could not all be best, not in the smaller sense. My thighs spread like feathers, that was one demerit. My grandmother came from Naples; she had subtlety without finesse. lunch—then the staticky commercial—then the wrong-looking sneakers. Alfresco on a chairbed the woman confirms the natural. Natural it is to be disgusted and hopeless. Relating to her is what keeps me alive. Even the unfair trees and the lawn are alive. Five w’s: what when where why why? On the chairbed she is breaking out of the sun and the lawn. Each of us one cell in a universe of process. Realm of the universe, hers, and realm of the bourgeois dah-dah-dah. On the chairbed, in the sun, she’s turning yellow. She’s part of the carbon cycle. I toe several pits on the lawn. She’s been eating cherries and has dropped pits on the lawn. 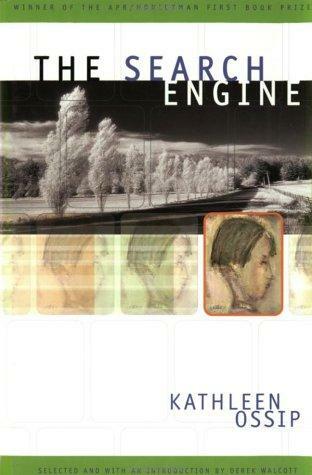 Kathleen Ossip, The Search Engine, Copper Canyon Press, 2002. "Beginning in a high-rise hotel and ending with a quasi-mythic suburban idyll, The Search Engine scans a dissonant, saturated environment. Kathleen Ossip’s poetry is word-rich and music-lush, lively, witty, and sharp. She deftly records the immediacies of life, interior and exterior, domestic and worldly, here and now."